Seto House (瀬戸屋敷) is a public samurai house located of Kaisei Town, Kanagawa. The house was used to be Seto who was samurai of Kanaijima. 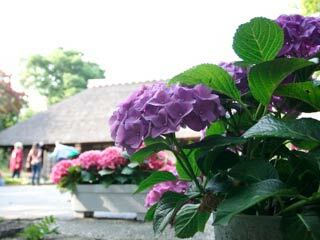 Now, it is a community spots of Kaisei where has lots of events and activities, especially during the Ajisai Festival. Admission: free but the same as a parking. 1. use Odakyu Line to Kaisei. It has gallery and free markets which sales local food and products. The lunch box is very famous around Kaisei. The house, the gate and garden are still remains as the samurai house. It is very nice historic site with the connection of Kaisei people.